Here is the reason I could not attend last Tuesday's CA-CPD star party. On Tuesday, April 12, Discoveries Unlimited of Valparaiso and the Challenger Learning Center of Northwest Indiana brought former astronaut Capt. 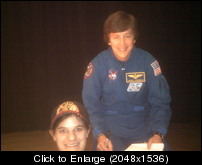 Wendy Lawrence to Star Plaza Theater to speak to kids about the importance of a STEM (science, technology, engineering, and mathematics) education. Capt. Lawrence was a naval aviator before joining the astronaut corps, and holds a Masters degree in ocean engineering. Hillary really wanted to hear Capt. Lawrence speak (I did too). Even better, Hillary’s mom’s employer was a sponsor of the event, so she got us complimentary tickets. There was an exhibition area in the lobby of vendors, geared towards colleges and space themes. Calumet Astronomical Society had considered sponsoring a booth, but decided against it. (Dr. Sally Ride was originally scheduled to be the speaker, but when she had to cancel, CAS lost interest in the event). Attendance was rather low, so maybe they made the right decision, but I couldn’t help thinking that we should have had a presence. Capt. Lawrence spoke about being inspired to become an astronaut by watching the Apollo 11 Moon landing as a ten year old girl. Entering college, she still had that dream, but was almost talked out of pursuing an engineering degree when upper classmen told her how hard the courses were. She admitted to being talked out of aeronautical engineering, but still pursued an ocean engineering degree. In response to a girl’s question, Lawrence stated that it was not intimidating graduating from the Naval Academy as a women. It was not her gender that limited her opportunities at NASA, but her small stature; she was too small to fit in an EVA spacesuit. After several years of astronaut training, on March 2, 1995, Lawrence finally lifted off on a space shuttle mission. As flight engineer, she had to work closely with the commander and pilot, but upon reaching orbit, her commander told Lawrence to take a break and look out the window. In that moment, looking down on Earth, she realized that after 25 years of hard work, her dream of flying in space had come true. During a question and answer session, Lawrence was asked by two school kids questions that I would have liked to ask. Earlier that day, it was announced where the remaining space shuttles would be displayed after retirement. Asked about American astronauts needing to rely on Russian Soyuz capsules for transport to and from International Space Station, Lawrence said she was comfortable with our Russian partners and their reliable vehicle. She went on to say that with private enterprises now developing space vehicles, she thinks there will be far more opportunities for space flight for future generations of astronauts. She ended by saying that she was happy to retire from spaceflight, and looked forward to the day when a new generation of astronauts lands on Mars.